Brent Weeks will sign and discuss The Broken Eye (Orbit; $28), the third book in the Lightbringer Series. We're looking for 5 fans to join the Blackguard Captains and help spread the word about Brent's event! What do the Blackguard Captain's get? a tour t-shirt copies of The Black Prism to share with his/her friends in advance of the event, encouraging them to attend an invitation to meet Brent at your store before the event Preorder before July 29th, and we'll select 5 random customers to join! Places in the signing line are reserved for those who purchase a copy of The Broken Eye from The King's English. Brent Weeks’s on-line bio states he started writing on bar napkins, then on lesson plans and then full time and eventually someone paid for it. We are so happy that he did as he presents us with the third in the spectacular Lightbringer series. Chromeria faces a civil war that will engulf the known world but the powers of the Prism have been lost and Kip Guile will have to survive the ascendant order of the hidden assassins called The Broken Eye. The evening promises to be entertaining with Brent leading a lively discussion, reading, and answering most of your questions, assisted by his Street Team, the Blackguard Captains. This is a numbered event – numbers for the signing line are free with the purchase of The Broken Eye from Mysterious Galaxy, available August 26th, starting at 10 AM! What should Brent Weeks’ fans expect at his event for The Blinding Knife? “To hear an unreleased chapter available nowhere else, to get your books signed, to see his bright happy face, and at least 87 xp toward your next Geek level.” We also appreciate the fact that Brent encourages his fans to buy his books from his host stores on the tour, including Mysterious Galaxy! So join us, talk with Brent about the Night angel or the Lightbringer series, listen to him read a chapter from The Blood Mirror (book 3), and enjoy! Brent Weeks promotes The Blinding Knife. Brent Weeks reads from The Black Prism. Brent Weeks is currently considered a "single author." If one or more works are by a distinct, homonymous authors, go ahead and split the author. 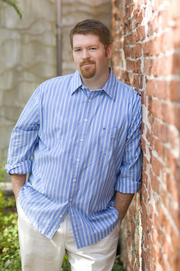 Brent Weeks is composed of 2 names. You can examine and separate out names.